OK! The next month is getting really exciting – two new albums out now, Bass Guitar Magazine‘s October issue with me on the cover is in shops now, and the tickets for my October tour with Jonas Hellborg are selling well. 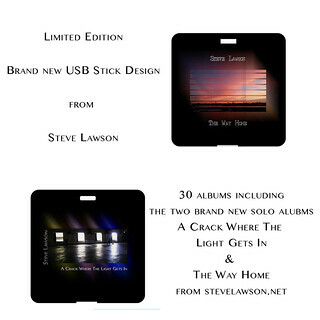 There’s a brand new design for the ‘everything’ USB Stick, a limited edition square one, featuring the artwork to both the new albums. So, Competition Time! I’ll be giving away three of these USB Sticks in October to people picked at random from anyone who posts a selfie with their copy of the new issue of Bass Guitar Magazine with me on the cover. A few people have done this already, which is really lovely to see. Take a pic, post it on Twitter, Instagram or Facebook and tag me in it, and I’ll stick all the names in a hat in October and send out 3 USB Sticks. If you can’t wait that long, You can order one now for £25, OR, for the bargain of the century, subscribe for £20 and then buy the subscriber-only offer on the USB stick for £13 – you then also get the 10 album FingerPainting set included too. So that’s 40 albums (seriously, 40! ), a live video and my novel, PLUS a year’s worth of new releases with the subscription, for £33 plus postage. So, get snapping and tagging. And if you’ve bought the new albums, please do post a review on Bandcamp and share the link to them around on Twitter. Hope you’re enjoying the magazine article. More fun stuff on the way!